6Dh-1-001 and 6Dh-1-002, photographed in Dębica on June 24, 2017, by Roman Szumski (source: www.commons.wikimedia.org). Photo of the 6Dh-1-002, taken on the same occasion. 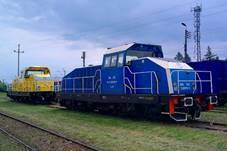 Tabor company of Dębica was founded in 1993, its prime occupation being initially repair and modernization of locomotives and rolling stock. In 2013 it was split into two enterprises, of which one is a licensed railway operator and leasing company. The second one, Tabor Dębica Sp. z o.o., has retained much of the company’s original scope of activities. In 2008 they undertook a modernization of class SM42 (Fablok factory type 6D), standard medium switcher of PKP and many private and industrial operators. 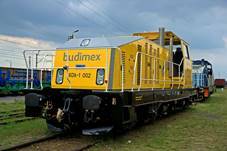 Similarly to modernization proposed by Newag (type 6Dg – described under a separate entry), Caterpillar C27 V-12 diesel engine was fitted, together with new Emit GHp400 M4C generator and control system. Ls430 traction motors were retained, as were wheelsets and trucks. The body was thoroughly redesigned, with lowered front and rear cowlings to improve visibility from the cab. Type certificate was issued by UTK (Urząd Transportu Kolejowego – Office of Rail Transport) in 2008, but the prototype – rebuilt SM42-2437, Fablok 9853/1977 – was outshopped only in August 2016. It was designated 6Dh-1-001, although alternative designation 6Dh-001 is also used, and given commercial name Alf. This locomotive still remains the manufacturer’s property. Second example, 6Dh-1-002, for Budimex S.A. company, followed in June 2017. Until now (August 2017) no further orders have been placed. This type has thus fared much worse than the 6Dg from Newag, of which about 170 examples have so far been delivered. Type 6Dh, with sloping front and rear cowlings, is somehow unique in a rather numerous family of SM42 modernizations.